Pets are fun, fabulous — and often furry. They steal our hearts and enrich our lives. Pieced Pets will tickle your fancy as these playful patterns bring these cherished family members to life. 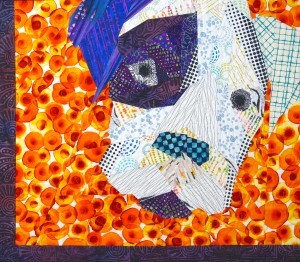 The patterns in this series will initially focus on dogs (yes, I am a lifelong dog lover). Other patterns of pets large, small and exotic will be included in the series. In this class, you will select from several patterns to create your chicken wallhanging. A brief discussion introduces the methods and techniques of freezer paper templates. You will then prepare a freezer paper template for your chicken pattern and begin the process of selecting fabrics for your design. We will also discuss sewing methods and sewing order to complete your wallhanging. Select one of the pet patterns available for this class. Patterns will be available for purchase prior to class.